Field Notes: Should I Plant Birch? The Birch is one of our iconic American trees. Many species of Birch can be found growing wild in our forests (the Paper Birch, Yellow Birch and Grey Birch to name a few). So it's easy to believe that -- like many native plants -- a Birch would be relatively disease and pest resistant. Wrong. In the suburban garden, a Birch is essentially an ornamental tree. When planting a Birch, the first consideration should be where to site it. 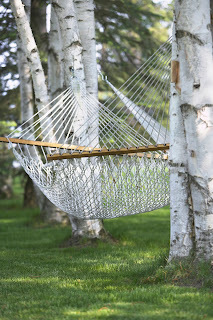 A healthy Birch can easily reach 40-50 feet in height, so give it some room. Birch need full sun (or close to it) -- BUT they also need cool moist soil. If you think of them in their native habitat -- such as an Appalachian valley -- their trunks and leaves would grow above the low-lying vegetation that insulates and protects their roots. So when you plant a Birch in your yard, the shallow root system needs the same protection. A thick layer of mulch helps to even out the temperature and retain soil moisture; this is a tree that definitely needs water in dry weather, since the roots lie in the top layer of soil. Birch trees are also susceptible to a number of pests and diseases, such as the Bronze Birch Borer and the Birch Leafminer. It also is susceptible to several fungi. 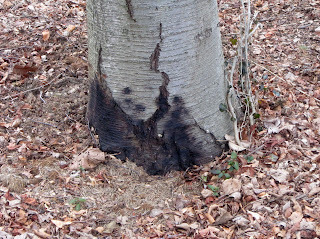 Careful pruning of Birch is very important since opportunistic fungi can enter an unhealed wound. The picture above shows a bleeding canker on a Black Birch -- a sign of seriously declining health. Unfortunately, this client consulted us too late to save this tree, although it doesn't have to be taken down immediately. Part of the problem for this tree was too much mulch piled around the trunk -- mulch is good for the roots but NOT directly around the trunk. So given all these issues, why do we continue to plant Birch? It's obvious. Just look at the picture below.